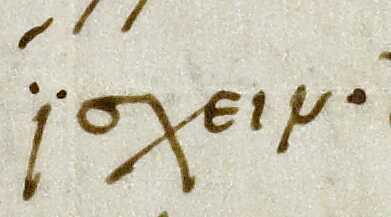 The Homer Multitext project is creating digital, diplomatic editions of Homeric manuscripts and papyri. Our editions document what we are able to read, and our readings are cross-referenced to citations of the visual evidence we used. In the following examples, images are linked to interactive versions of the cited visual evidence. Use Unicode “Combining Macron” character. 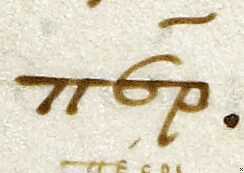 Our transcription does not note ligatures or variant letter forms: readers interested in these visual features of the manuscript should consult the associated high-resolution images. We treat regular abbreviations for morphological endings, for prepositions, and for the conjunction καί as variant letter forms, and silently expand these in the transcriptions. Use TEI persName element; include an @n attribute with the full URN value from the [reference table of identifiers for personal names][pers]. Use TEI placeName element; include on the @n attribute has a full URN value from the [reference table of identifiers for place names][place]. Use TEI rs element, with @type attribute = waw. unclear. 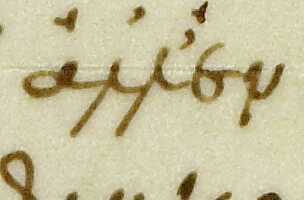 Part of the letter is visible, but taken by itself cannot be unambiguously read. missing. 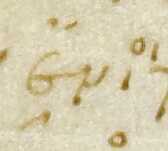 No trace of the letter remains, but it is clear from the context that one or more letters were originally present. Use TEI unclear element. If the unclear element breaks up a word token, wrap the entire work in a TEI w element. Use TEI gap element. Use @unit attribute for the type of the gap (for example, “letters” or “words”), and @extent to indicate how many units are likely included in the gap. Use TEI corr/sic pair for corrections when the wants to correct a reading that is unintelligible in the text; group the pair in a TEI choice element. Reference tables for identifiers for personal names and place names, are maintained in the hmt-authlists github repository: see the hmt-authlists web page.